I love to read, and I take every opportunity I can to instill that same love of reading in my children. I started collecting children's literature before I became pregnant with Emma. I try to read to my children on a daily basis, but that doesn't always happen. Recently, Emma's elementary school had it's fall Scholastic Book Fair. 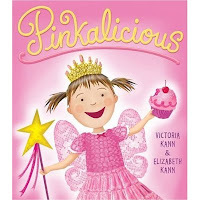 On Emma's wish list was a book called Pinkalicious by Victoria Kann and Elizabeth Kann. I hadn't heard anything about the book although I had seen it's cover previously. I sent Emma to school with money to buy the books on her wish list. I was hooked after my first reading of Pinkalicious. It is a delightful book about desire and discipline, and as is evident in the title, all about the color pink. For a girl, is there such a thing as too much pink? Any girl, favorite color pink or not, will absolutely love this book. Pinkalicious can be purchased here and here. My daughter would adore this. She goes crazy for the pink stuff. Cute book.